Ever need to change attributes (date and time of their creation etc.) of files and folders? Quickly? As you know, with Windows it's tedious and slow. Not so with Attribute Manager! Attribute Manager allows you to change Read-Only, Hidden, System and Archive attributes. You can change the date and time of creation, last access, last modification of files and folders. 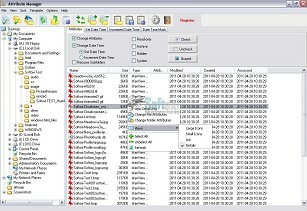 Attribute Manager uses templates that allow you to configure changes and apply them to an unlimited number of files and folders. • Change all the known attributes of files. • Batch change for the attributes, date and time. • Increase or decrease date and time. • Partial modification date / time. • Processing a large number of files and folders. • System of reusable templates. • File manager, as well as in Windows Explorer. • Detailed manual with examples.